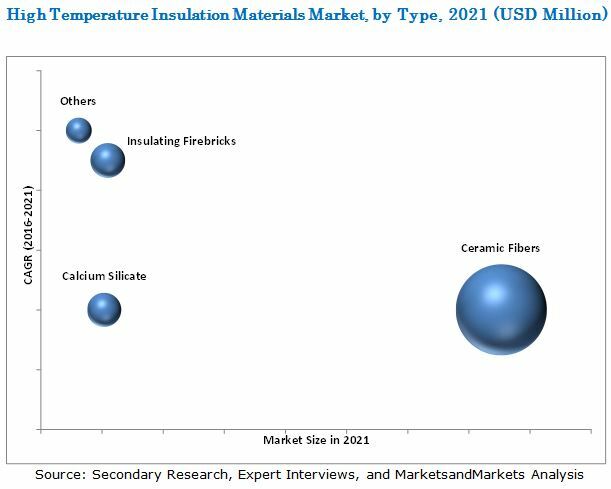 [172 Pages Report] The High Temperature Insulation Materials Market is projected to reach USD 5.13 Billion by 2021, at a CAGR of 8.3% between 2016 and 2021. In this study, 2015 has been considered as the base year and 2016 to 2021 as the forecast period for estimating the market size of high temperature insulation materials. The growing demand for high temperature insulation materials in several end-use industries, especially in the Asia-Pacific, North America, Europe, South America, and the Middle East & Africa, coupled with rapid industrialization in emerging countries is expected to drive the growth of the high temperature insulation materials market. Note: *Core competencies of companies are covered in terms of their key developments, SWOT analysis, and key strategies adopted by them to sustain their position in the market. This research study involved the use of extensive secondary sources, directories, and databases, such as Hoovers, Bloomberg Businessweek, and Factiva to identify and collect information useful for a technical, market-oriented, and commercial study of the high temperature insulation materials market. The primary sources are mainly several industry experts from core and related industries and preferred suppliers, manufacturers, distributors, service providers, and organizations related to all segments of the industry’s supply chain. The bottom-up approach has been used to estimate market size of high temperature insulation materials on the basis of type, temperature range, end-use industry and region, in terms of volume and value. The top-down approach has been implemented to validate the market size, in terms of volume and value. With the data triangulation procedure and validation of data through primary interviews, exact values of the overall parent market size and individual market sizes have been determined and confirmed in this study. The high temperature insulation materials market comprises materials, such as ceramic fibers, insulating firebricks, calcium silicate, and other materials (that include perlite, microporous materials, and vermiculite). Ceramic fibers are the most common type of high temperature insulation material. They are also known as alumino-silicate glass wool, and are produced by melting a combination of alumina (Al2O3) and silica (SiO2), usually in a weight ratio of 50:50. Insulating Firebricks (IFB) comprise alumina-silica composition, along with organic fillers to provide controlled pore structure. They are commonly used as an insulating material for very high temperature areas, such as blast furnace and kiln, in several end-use industries. Calcium silicate is an excellent insulating material utilized for high temperature (up to 1100○C) applications. Other materials including perlite, vermiculite, and microporous materials are used in various end-use industries requiring thermal insulation between temperatures of 600○C to 1700○C and above. High temperature insulation materials are used to avoid heat loss and save energy. “This study answers several questions for stakeholders, primarily which market segments need to be focused in next two to five years for prioritizing their efforts and investments”. This research report categorizes the market for high temperature insulation materials based on type, temperature range, end-use industry, and region, as well as forecasts revenue growth and analysis of trends in each of the submarkets. The high temperature insulation materials market is projected to reach USD 5.13 Billion by 2021, at a CAGR of 8.3% between 2016 and 2021. Growth of this market is primarily attributed to the increasing demand for high temperature insulation materials from varied end-use industries in the Asia-Pacific region. Players in this market are adopting various organic and inorganic strategies to expand their presence in Asia-Pacific, the Middle East & Africa, and Latin America. Ceramic fibers are the largest type segment of the high temperature insulation materials market. These fibers are the most commonly used high temperature insulation materials due to their superior properties, such as low thermal conductivity, high strength, and lightweight, among others. The temperature range of 600°C-1100°C has the largest market among all temperature ranges. This is due to the fact that materials such as ceramic fibers, insulating firebricks, and calcium silicate, among others find maximum operations in the temperature range of 600°C-1100°C. The petrochemicals segment is the largest end-use industry segment of the high temperature insulation materials market. Growth in the petrochemicals industry can be attributed to the growing demand for petrochemicals products across varied regions worldwide. To address the growing demand for these products, manufacturers are focused on enhancing their production capacities. This has led to the development of new manufacturing units that use high temperature insulations, owing to the growing concerns associated with energy savings and GHG emissions. Asia-Pacific is the largest regional segment of the high temperature insulation materials market, in terms of value and volume. Countries in this region such as China, India, Japan, and South Korea are witnessing a gradual increase in the use of high temperature insulation materials. The shift in the manufacturing base of several end-use industries, increase in foreign investments, and rise in the number of new manufacturing establishments in different sectors are expected to be the key driving factors propelling the growth of the high temperature insulation materials market in the Asia-Pacific region. Although, the high temperature insulation materials market is growing at a rapid pace, the market growth is affected by a few factors. Several countries worldwide have formulated strict regulations concerning the use of ceramic fibers, due to their carcinogenic nature. This, in turn, acts as a restraint impacting the growth of the high temperature insulation materials market. Morgan Thermal Ceramics Plc (U.K.), Unifrax I LLC (U.S.), Etex Group (Belgium), RHI AG (Austria), and Almatis GmbH (Germany) are the most active players in the high temperature insulation materials market. Morgan Thermal Ceramics Plc is a key player in the high temperature insulation materials market. As part of its growth strategy, the company has focused on the development of new products made of high temperature insulation materials. Another player that has established a strong foothold in the high temperature insulation materials market is Unifrax I LLC (U.S.). The company focuses on investing in mergers & acquisitions and new product launches to develop innovative products and new technologies. 12.2 Luyang Energy-Saving Materials Co., Ltd.
12.6 Isolite Insulating Products Co. Ltd.
12.11.7 M.E Schupp Industriekeramik GmbH & Co.